Perfect for doorways, hallyways or as wall hangings. We were very happy with our turtle curtain. It is really nice. Beautiful, perfect as an alternative to a door for our pantry. Easy to install, just as described on the website. Very happy with this purchase. Easy to put up - takes minutes - and looks fabulous. Needless to say, my granddaughter loves it and, whilst sitting on the toilet, talks to the fish and sea turtles. So do I! I put this curtain up as a block for an outdoor shower in Florida and love it. It is beautiful and provides the privacy I wanted. It does well in Florida weather (sun and rain). I have purchased string curtains previously and have loved them also. The design on this curtain is beautiful. I have received rave reviews from my neighbors when they have seen the curtain. by altering both sides. The length was perfect. 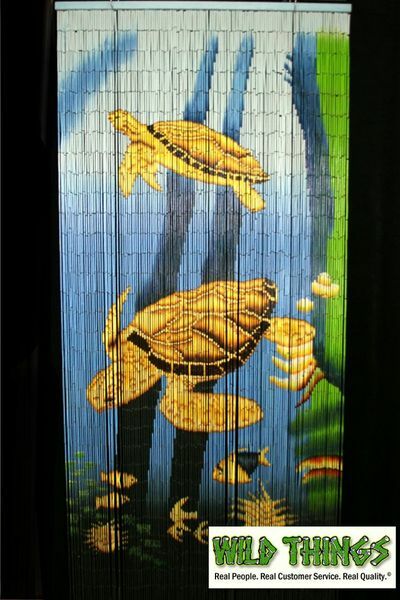 This window gets a lot of sun so during the day, you really don't notice the turtles. Come night it is a lovely sight. People who stay are in awe! Overall we are happy with the purchase. WE wrongfully thought it was strung with one piece of wire. Because the linked together with wire hook type fateners they tend to hang up on material and kink ver easily. Prosthe pieces are painted all the way around. ConsThe way the pieces are linked they easily hook on clothing and if bent the crack the bamboo pieaces. The item is unique and beautiful. Arrived quickly and as ordered. Very nice product. turned out great and just what my daughter was looking for :) good thing i ordered an extra one (plain brown) my son asked if he could have one for his doorway as well!! haha! my kids taking us back to "day" LOL! Merchant Response:We would LOVE to ship to Hawaii cheaper. If you can find a carrier who does it, please do let us know! We've been battling with it for all of these years that we've been in business. We only charge exactly what we are charged for shipping to HI and Alaska. Puerto Rico is also in the US and it's the same thing. We're so sorry! We're super happy that you love the curtain, though. Consjust our typical HAWAII shipping charge?? we are part of the UNITED STATES was a bit disappointed to find out after the order i had to pay more for shipping to HI :( don't understand how some places can ship here for free...? jus an fyi. Exactly what I hoped for - a perfect curtain between my summer cottage kitchen and dining room! Other reviews here complain about the strands being too far apart, but I think they are just right. The curtain is semi- transparent from dead ahead but very bright and colorful from other angles. East to install - you'll need a hammer, two sturdy nails, a yardstick or tape measure and probably a clear area of floor to lay the curtain out when unpacking. The beads are very light individually, so handle carefully to avoid breaking any. ProsEasy to install. 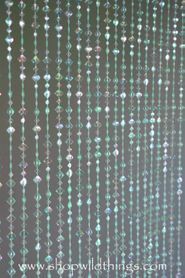 The beads are graduated - thicker at the top of the curtain, thinner at the bottom - which adds to a nice underwater effect when it moves. Above and beyound what I had expected. Beautiful scene, excellent painting. My bathroom is done in beach scene and this is so cool to walk through the water and step onto the beach !!! Beaded Curtains are always great, and shipment was fast.